NEW trade figures from South Korea on September 1st surprised even the gloomiest of economic forecasters. The country’s exports shrank by the largest annual amount in six years, down 14.7% last month from a year earlier to under $40 billion, according to the ministry of trade, industries and energy. Few analysts had expected more than a 6% drop: though exports have dropped every month since January, they declined just 3.4% in July in annual terms. Morgan Stanley, an investment bank, tempered its growth forecast for South Korea down to 2.3% from 2.5% for the year. Exports account for roughly half of South Korea’s GDP—and a quarter of all those go to China, its biggest trading partner. South Korea has been struggling with the rise of its currency, the won, against the Japanese yen in key export markets; now China’s successive devaluations have started to bite. Provisional figures released today showed that South Korean car shipments dropped steeply in August, by nearly a third. Though exports of smartphones rose, fast-rising Chinese handset makers are increasingly vying with Samsung Electronics of South Korea for global market share (its profits have dropped for five consecutive quarters). A weaker yuan is also keeping holidaying Chinese shoppers away—just as the country attempts to woo them back after an outbreak of Middle East Respiratory Syndrome (which infected 186 and killed 36) hit South Korea in May. Low global oil prices are also behind the startling figure. Petroleum products are a key South Korean export, and their price has dropped by over 40% from last August. 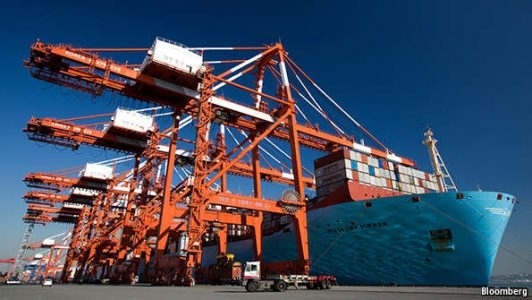 The ministry of trade today pointed to this distortion to downplay concerns that falling exports might presage serious weakness in the domestic economy; by volume, it said, total exports actually grew by 3.8% in August from a year earlier. The ministry also argued that local manufacturers ought to be more profitable given the lower cost of importing raw materials. Only last month the finance minister, Choi Kyung-hwan, argued that a weak yuan could be a boon: if Chinese exports increased, so too would demand for intermediate goods, such as electronic components, which make up the bulk of South Korea’s exports to China. Market watchers are less sanguine. Frederic Neumann of HSBC, a bank, says the plunge is “pretty serious”, not least because South Korea has “long been a reliable bellwether” for global trade. South Korean manufacturing sits at the top of the production chain, he says: a big chunk of its exports do indeed go into other finished goods, like Chinese smartphones and American laptops. But if demand slows there, so do requests for chips and screens. That means that Korean macroeconomic data “picks up very early changes in the global industrial cycle”. Neither is a slowdown in China the only source of export weakness; South Korea's exports to the euro area plunged by 21%, more than twice the decline in exports to China. Recent figures show that the economy expanded by a feeble 0.3% from April to June compared to the previous quarter: its weakest gain since 2009. The government has already cut its growth target from 3.8% to 3.1% since January; for its part the Bank of Korea has been cutting its key interest rate, now down to an all-time low of 1.5%. Ever more analysts expect South Korea's central bankers to shave it again soon, and perhaps even as early as next week, when they gather for a policy meeting on September 11th. If South Korea's bellwether status is anything to go by, central bankers elsewhere ought to be paying attention as well.